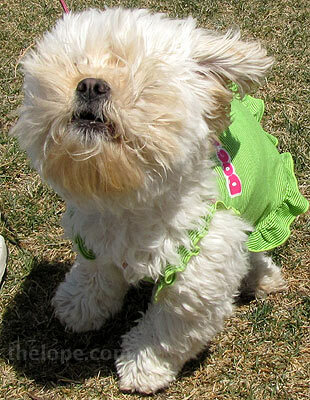 Sniffing the ground is Queen Maile, ordained so by Mayor Trish Rose. 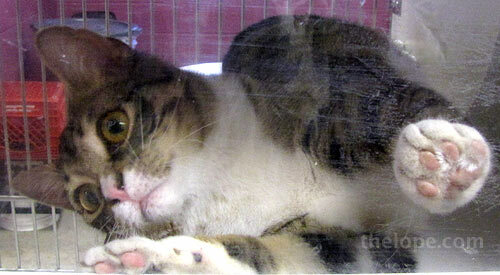 Maile's human is Pam Paulsen (pictured), who also owns a cat named Mokihana, and thereby hangs a Polynesian tale. Pam used to live in Hawaii on the island of Kauai. Maile is a fragrant vine used in leis. Mokihana is the name of a Hawaiian tree, the anise scented fruit of which is also used in Leis on Kauai. Cool, huh? 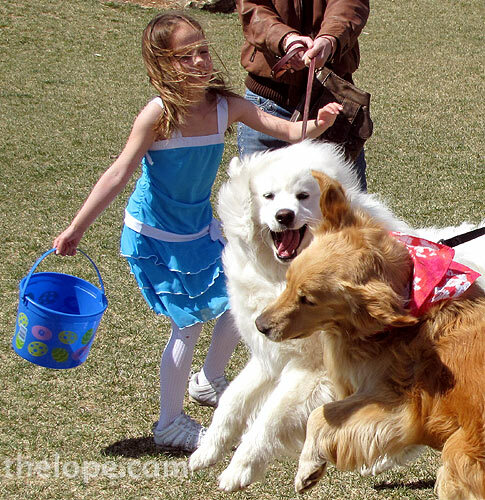 Maile was crowned, along with a king doggie, after an Easter parade Saturday at the new Hutchinson Dog Park on South Severance near the Hutchinson Animal Shelter. 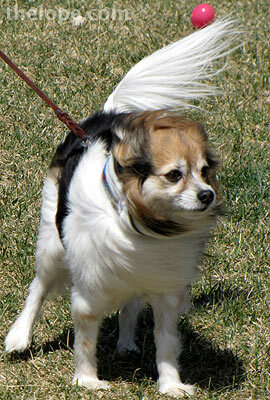 It was a windy day, which made for interesting doggy pictures. Humans got blown around a bit, too. 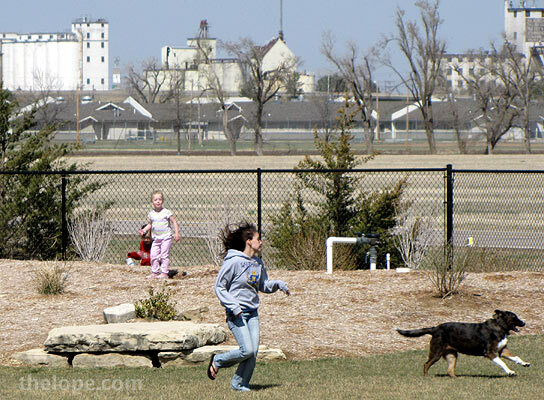 The dog park is a pair of large fenced areas with a bit of landscaping for variety. I imagine this place is a godsend for people with dogs and no yards. 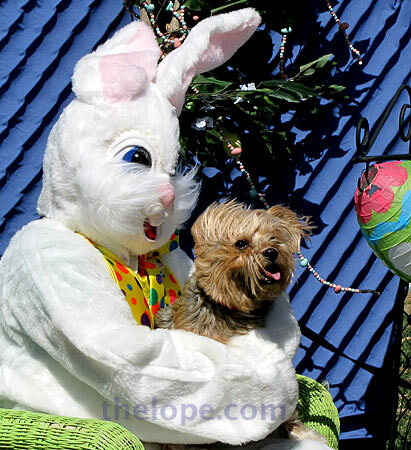 For a donation, the Easter Bunny would pose with your dog. 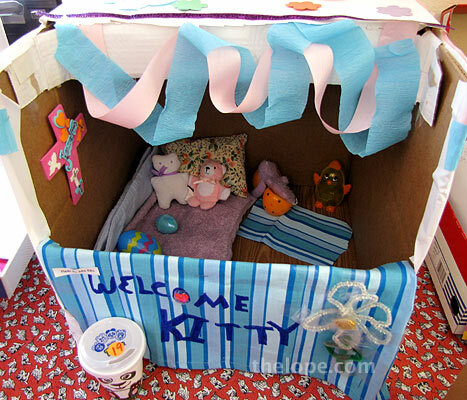 Inside the Hutchinson Animal Shelter, there was a kitty condo decorating contest. People could vote by dropping quarters into the accompanying cups. 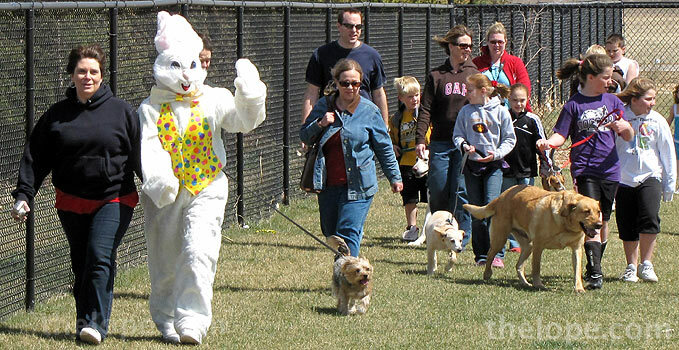 Julia Ellis won with this entry. 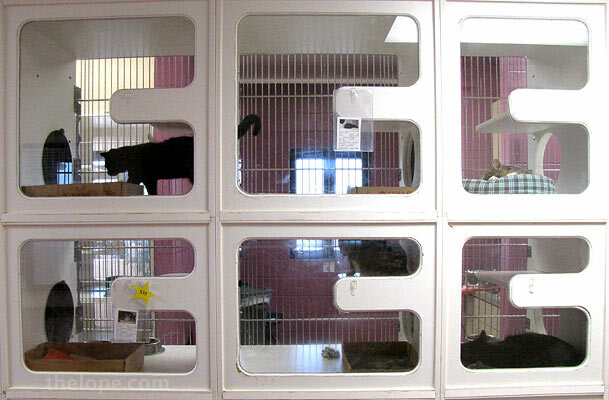 But the real kitty condos of the animal shelter are these extensive interconnected but separable chambers that hold cats waiting for a home. 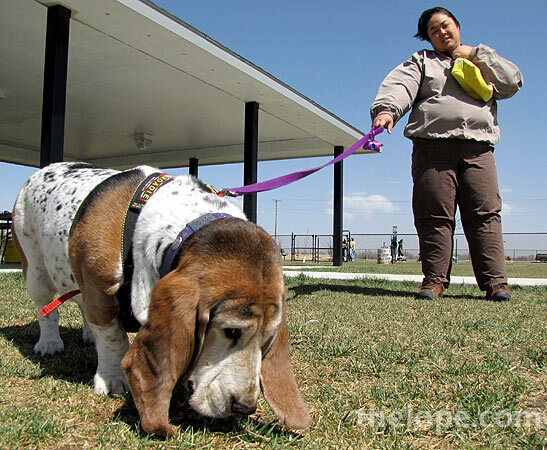 The whole place is impressively clean and lends to its role as adoption facility that works hard to place healthy cats and dogs. 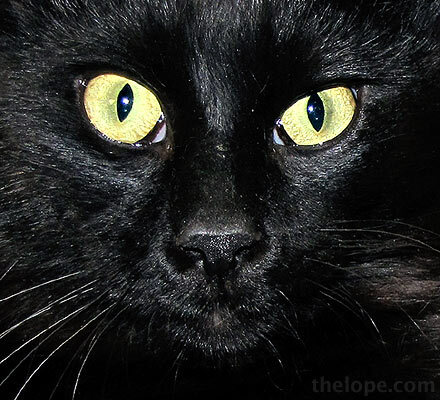 These are the eyes of Portabello, a striking beautiful four year-old black domestic short-hair cat - wormed and vaccinated. 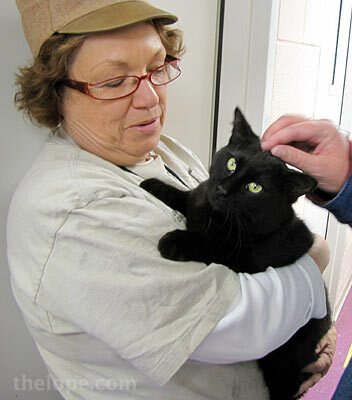 The animal shelters works with cats to see that they are socialized. Here, Hazel holds Portabello. 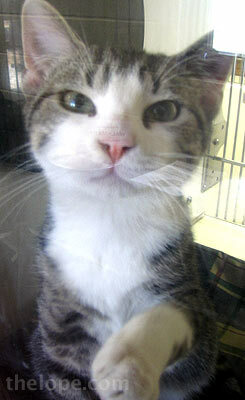 This is Eric, six months old - also vaccinated and wormed. Eric is very playful kitty, and even tried to play with me from within his chamber. omg. 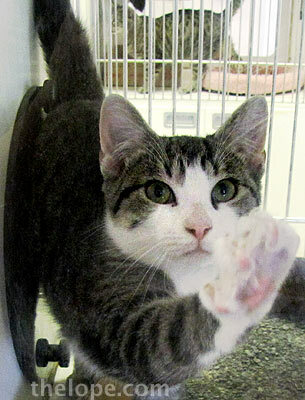 "I can haz home?" Hey Rayne, I was trying to move cats. It's worth using admittedly trendy language if I think it might work. Problem is...it catches...yeah..."I can haz dinner"...stuff like that.